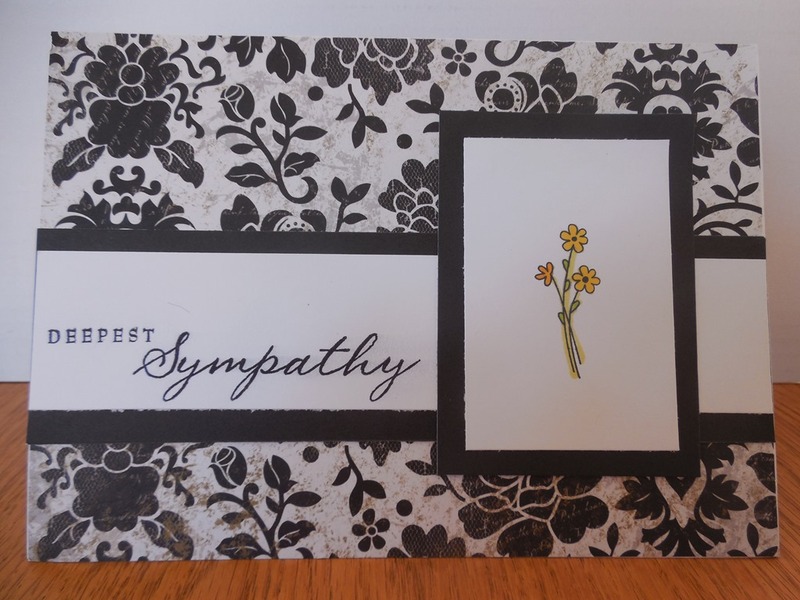 Sympathy cards make me sad…it means someone has an ache in their heart that will never go away. 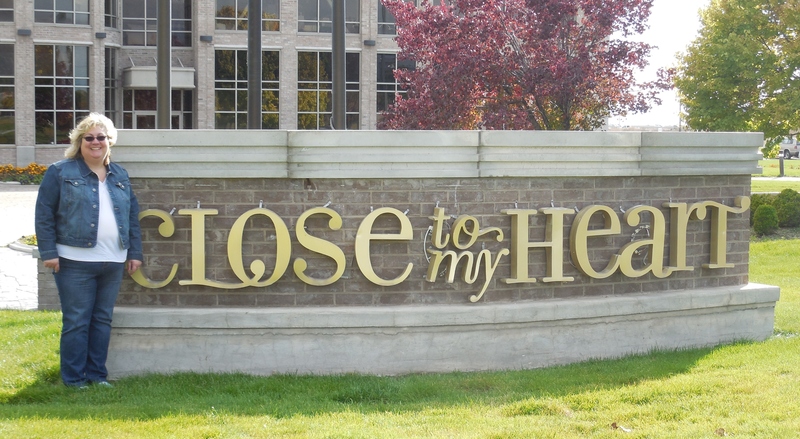 I remember all the sympathy cards that came when my mom died in 2012 and how knowing that people cared got me through some of my darkest days. 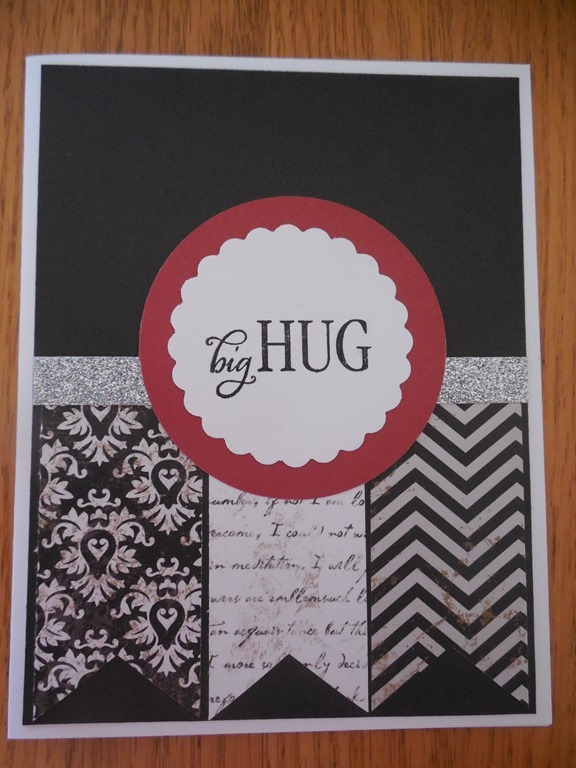 The Big Hug stamp set is not a sympathy set per-say, but it has several sentiments that can be used as such. Our friends wife died in an accident this week so I wanted this card to have a little masculine touch. I played around with a pattern from the Wishes Book with the Pathfinding papers. I added a wooden leaf and some touches of gold for accents. I thought I’d wake up from my bad dream of losing a dear friend to cancer, but since it didn’t seem appropriate to just wallow in my own grief and not acknowledge her death I made an assortment of sympathy cards with some left over paper from the For Always paper packet. 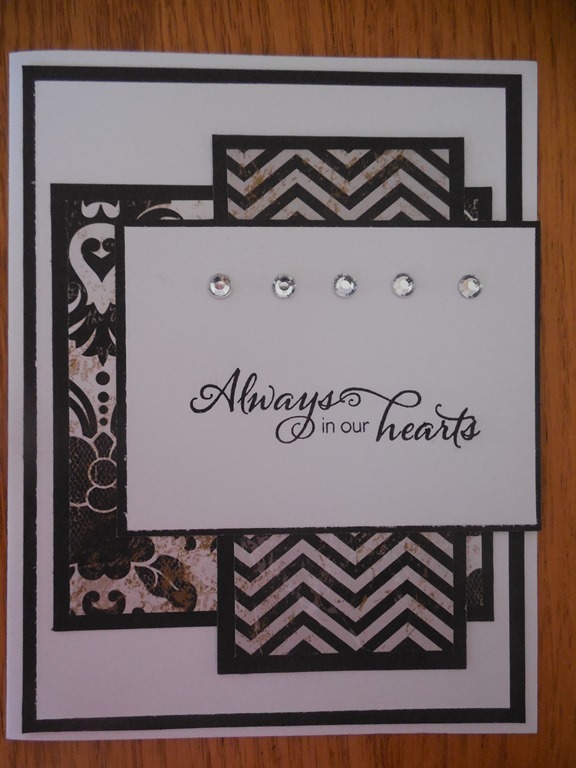 The stark contrast of black and white with minimal embellishments seemed perfect. 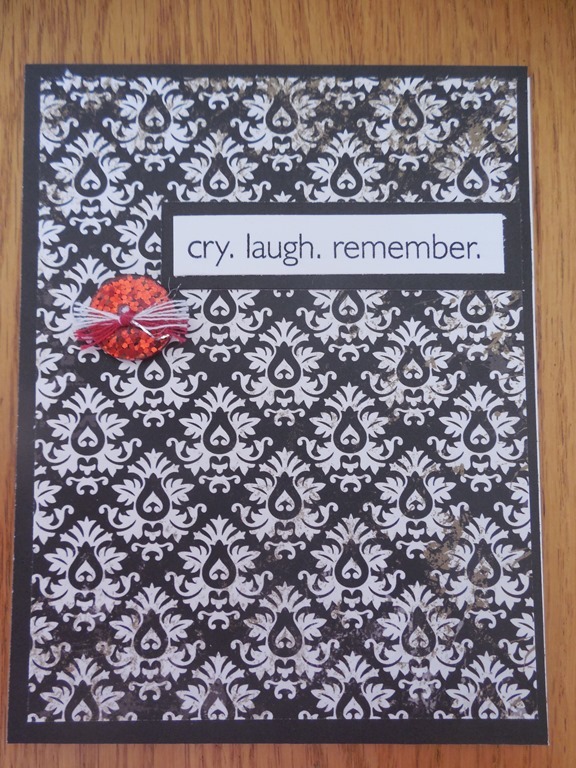 Sympathy cards are my least favorite to make, yet I know how much comfort they brought me when my own mom died in 2012. 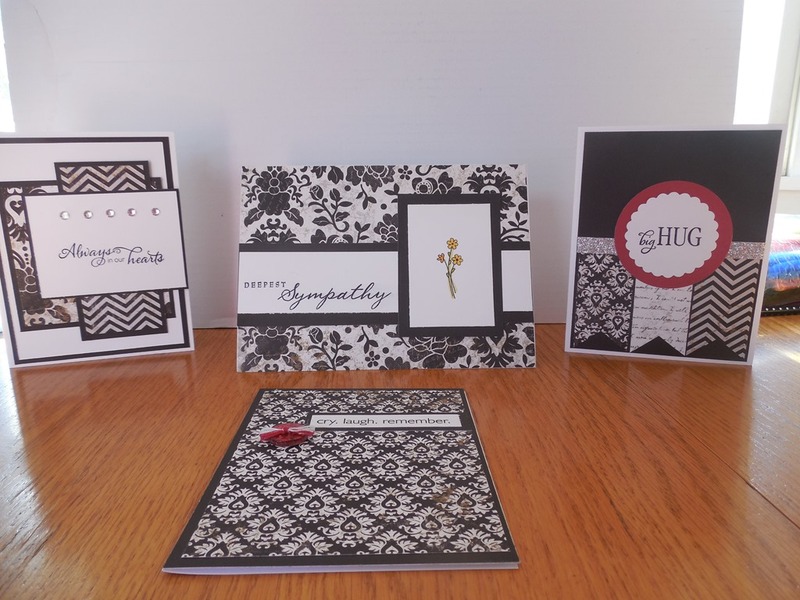 The first three cards are standard 4.25 X 5.5 cards from sketches I found on Pinterest and the last card was created using a 5 X 7 pattern from the Wishes pattern book. 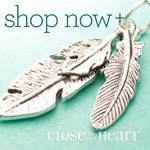 I love the versatility of the sketches available in the pattern books available through Close to My Heart. 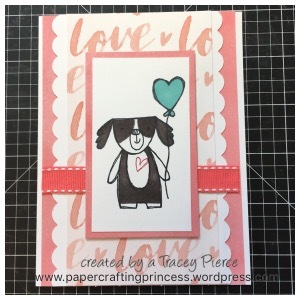 Using them along with the assorted papers in the paper packets can really make your card making quick!